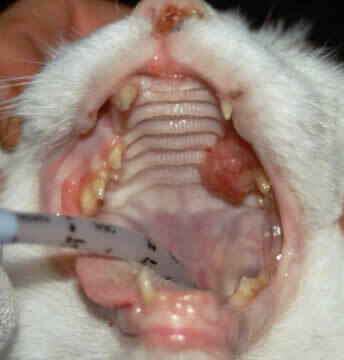 Oral squamous cell carcinoma is a nasty disease in cats. Frequently, these tumours are not identified until the lesion has progressed significantly with associated oral pain and halitosis due to bacterial infection. Oral squamous cell carcinoma is a cancer that arises from the cells that produce the lining of the mouth and throat including the gums, tongue, cheeks and tonsils. This cancer has an ability to grow invasively into the surrounding tissues and the visible part of the tumour is all too often just the proverbial tip of the iceberg. The average age for diagnosis of this disease is 11-12 years, although it has been described in cats from 2-18 years old. Presenting complaints commonly include facial deformity, loose teeth, weight loss and halitosis. Other, more subtle signs include oral pain and dribbling. Picture 1 shows an oral lesion from a patient whose only presenting complaint was a slightly reduced appetite. Right: Oral eosinophilic granuloma in a cat’s mouth. An important differential diagnosis for feline oral squamous cell carcinoma. Other conditions can affect the oral cavity that might resemble squamous cell carcinoma, such as eosinophilic granuloma complex, see picture 2. There are of course countless other causes of oral inflammation that must also be discounted. Right: An invasive feline oral squamous cell carcinoma (courtesy of Jon Slattery). Sadly, at this time the prognosis for these cats is usually poor regardless of treatment. Multiple different treatments have been explored including radical surgery, chemotherapy, radiation therapy, hyperthermia, cryotherapy, anti-inflammatory therapy and combinations of the above. Consistently, studies indicate an average life expectancy of only 1½ to 3 months. In some cases, the tumour arises in a site that is amenable to surgical excision; these are usually small tumours in the cheek or the mandible. A small proportion of cases do respond well to radiotherapy with about 10% of these cases living for a year or more. Side effects from radiotherapy are few. While skin and gum irritation is described, this happens extremely infrequently using the treatment strategy that we do. Paradoxically, the greatest problems arise in the patients who demonstrate an excellent response to therapy. If a large proportion of a tumour is killed by the radiation, this can leave a hole in the mouth which may harbour infections or may allow food and water access to the nasal cavity. 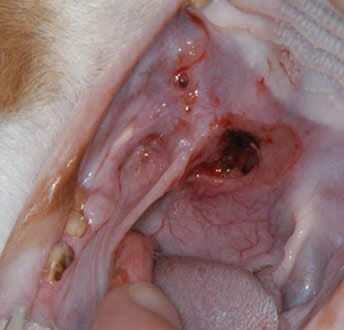 Above: An oronasal fistula resulting from treatment of feline squamous cell carcinoma.